Midge Ure - Vienna & Visage the 1980 tour tickets at Waterside Theatre, Aylesbury. 2019. Find the best Midge Ure - Vienna & Visage the 1980 tour concert tickets at Waterside Theatre, Aylesbury. Midge Ure - Vienna & Visage the 1980 tour (Waterside Theatre, Aylesbury). Former Ultravox member. Saturday, 12th October 2019. Midge Ure - Vienna & Visage the 1980 tour website. Approximate runtime 61minutes (including any interval). 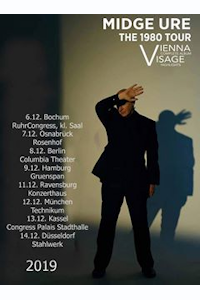 Midge Ure - Vienna & Visage the 1980 tour tickets: The tabs above allow you to select between links to suppliers and date searching. Click on a supplier's logo to see their details and on the 'buy now' button to see and check the tickets on offer.